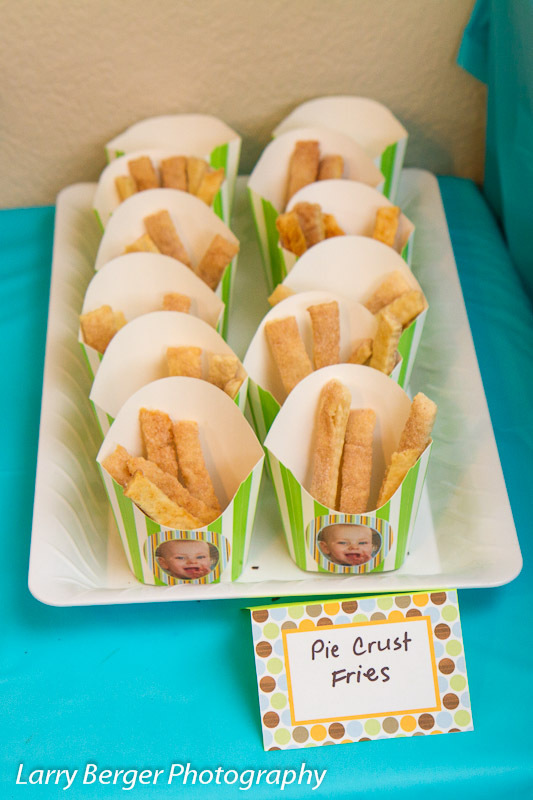 MOMMY'S SWEET CONFESSIONS: Pie Crust "Fries"
So one of the desserts I made for my son's 1st birthday party was pie crust "fries." Essentially pie crust dough rolled out, cut in strips, sprinkled with cinnamon sugar and then baked. I got these adorable french fry containers from the Oriental Trading Company. They were so easy and so much fun! Check out the other goodies here. Because really, what is better than a bunch of pie crust dough covered in cinnamon sugar??? Here is a blog post and pictures from King Arthur Flour, Pie "Fries"
1) Whisk together the flour and salt. 2) Dice the butter into small cubes, or cut it into pats. Work it into the flour until it's well-distributed, but not fully incorporated. Larger, pea-sized pieces of butter will be scattered throughout the mixture. 3) Tossing with a fork or your fingers, drizzle in the ice water. Stop adding water when the dough starts to come together, and grab it in your hands. If it holds together easily, without crumbling, it's ready. If it has dry spots, or pieces break off easily, add a bit more water until it's totally cohesive. 4) Gather the dough into a ball, and divide it in half. Gently pat/shape each half into a rough disk. Chill the dough for at least 30 minutes before rolling. If dough has been refrigerated longer than 30 minutes, allow it to warm at room temperature for 10 to 15 minutes, until it rolls easily. Here you can also place it in the freezer in a ziploc bag and save it for another batch if you don't need a lot. 5) After it has been refrigerated, roll out the dough on a lightly floured surface, to 1/4 to an 1/8 of an inch thick. Preheat oven to 350 degrees F.
6) Sprinkle liberally with the cinnamon sugar mixture, pressing in lightly. 7) Using a pizza cutter or pastry cutter, cut the dough in to 1/2 inch to 3/4 inch wide strips, and about 3-4 inch long segments. Using your fingers or a spatula, transfer them to a parchment lined baking sheet. 8) Bake for 12-15 minutes, until puffy and golden brown. Make sure to watch them carefully, they burn easily. Remove from oven, let cool, and enjoy! My favorite part too!! Thanks so much for visiting! That is a wonderful dip idea! These look delicious! I found you through Monday's Blog Hop. Love your blog! I also have 2 boys under 3. Cheers to a needed glass of wine! These are the cutest things ever!! Pinning!